It must be the culture I grew up in that makes me use car analogies for everything. This post, of course, is not about a new car, but a new white cane. I thought it might be time to purchase a new cane because mine was showing signs of wear. I am not sure how old my previous cane was but my best guess is about two years old. Two years may not seem all that old, especially considering the cane before that one was at least 5 years old. So why all the fuss? Well, I had forgotten how good a new cane feels. I imagine it is how someone feels when they get a new car. My new cane is very responsive and I feel more in control. It takes me through turns with no hesitation and I speed through intersections without drifting. I never realized how loose and unresponsive my old cane was until I took my first trip with my new cane. My new cane cost $35 and I did not have to go far to purchase it. I purchased it from Brian in our product center. I realize for those on a fixed income $35 is a lot, however, a free cane can be acquired from the National Federation of the Blind. The NFB provides one free white cane to anyone who is legally blind at no charge by simply filling out a short application. 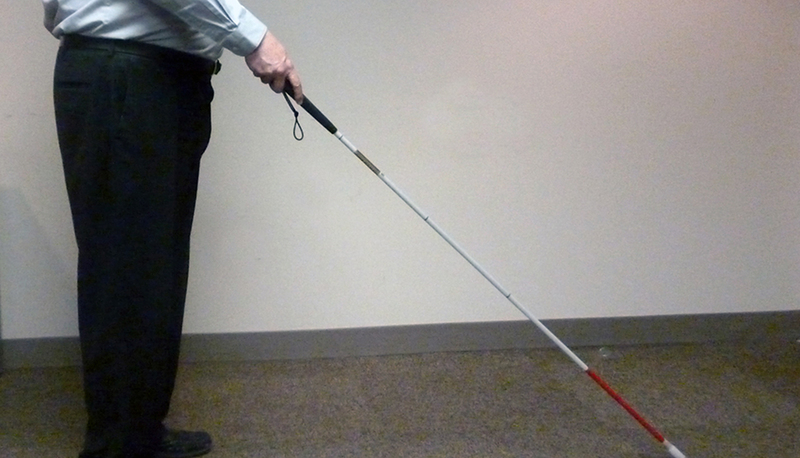 If you have questions about the free white cane program from the NFB, email freecane@nfb.org. One important note about getting a new cane. It is important to get the advice from an orientation and mobility specialist. Many factors go into choosing a cane that matches your individual needs. How fast you walk and the type of terrain you are traveling most often are just two things to discuss with your O&M professional before you purchase or request a new cane. I feel much safer with my new cane, and I decided I will purchase a new one every year. After all, my safety is worth it. What about you? How old is your white cane? How responsive does it feel in your hands? If you would like to investigate a new cane, contact our orientation and mobility specialist, Rachael Eschbach or Brian Hollandsworth in our Product Center. David is Manager of Assistive Technology at Second Sense. I know what you mean about the feel of a new cane. I usually travel with a fiberglass rigid cane with a glide tip, like the Iowa canes or the NFB canes. If I’m on really, really rough terrain, I like a really sturdy, folding aluminum cane with a ball tip. In addition to O. & M. specialists, it’s really good to consult with our blind peers who have literally been around the block a few times and know the canes which provide the most information in different circumstances. Thanks for sharing the joy of traveling with a white cane. I wish that more people shared this positive view of cane travel. For me, it’s almost like an athletic event and I absolutely love it! My fiberglass canes are replaced about once a year, and my all terrain vehicle canes are replaced as needed.